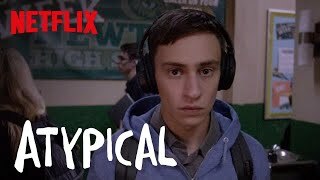 Atypical is a coming of age story that follows Sam (played by Keir Gilchrist), an 18-year-old on the autistic spectrum as he searches for love and independence. 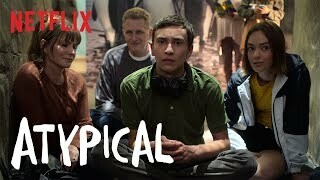 While Sam is on his funny and emotional journey of self-discovery, the rest of his family must grapple with change in their own lives as they all struggle with the central theme: what does it really mean to be normal? Jennifer Jason Leigh stars as Sam’s mother, Elsa, who is on her own journey of self-discovery. 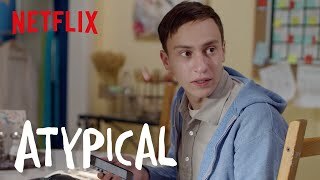 Michael Rapaport plays his father, Doug. Brigette Lundy-Paine (Margot vs Lily, The Glass Castle) plays Sam’s sister, Casey. 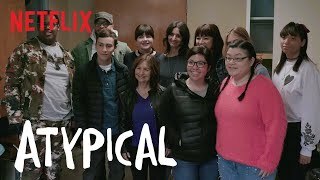 Additional cast includes Amy Okuda (How to Get Away with Murder) who plays a therapist, Julia, Nik Dodani (Alex Strangelove) who plays Sam's best friend, Zahid, and Jenna Boyd who plays Paige, Sam's on again, off again girlfriend. Clip: "I 100% Don't Care"